Window damage due to foundation settlement in Doylestown. We can help you fix your foundation with our warrantied solutions! Call us for a free foundation repair quote today! 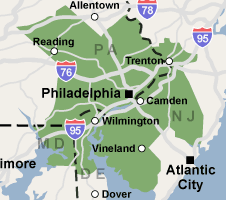 We serve Reading, Newark, Philadelphia, and many nearby areas in Pennsylvania, New Jersey, and Delaware. At Philadelphia Basement Systems, we address foundation settlement issues by installing foundation piers at key locations. The piers extend to stable, load-bearing soil, attached to the foundation with steel brackets. This repair work prevents further settling -- and can even allow the foundation to be jacked back to its original position. If you have a problem with your foundation, we can help. At Philadelphia Basement Systems, we offer free, no-obligation foundation repair quotes within our Pennsylvania, New Jersey, and Delaware service area. Each free quote includes an on-site inspection, personal consultation, and written estimate.